One of the many perks of getting married in Australia is that couples can wed pretty much anywhere! This couple who opted for a valentines day wedding ceremony decided to take advantage of this freedom to wed where ever they pleased. They planned a very intimate wedding in the company of 4 close friends (plus their Celebrant Jamie Eastgate) and when it came to deciding where to say their ‘I Do’s’ the special place that just felt right for them, took everyone by surprise – The Brisbane Airport Jetstar departure gate 36! The reason this unusual wedding ceremony location was special to the couple is that this was where they shared their first kiss after they had met at a function the evening before and the smitten groom offered her a lift to the airport. Can you imagine the butterflies she must have had as she got on to that plane. Although the ceremony would have been a great location to jet straight off on a romantic honeymoon from, instead they enjoyed a High Tea reception at the Brisbane Marriott Hotel with a small group of friends and family. 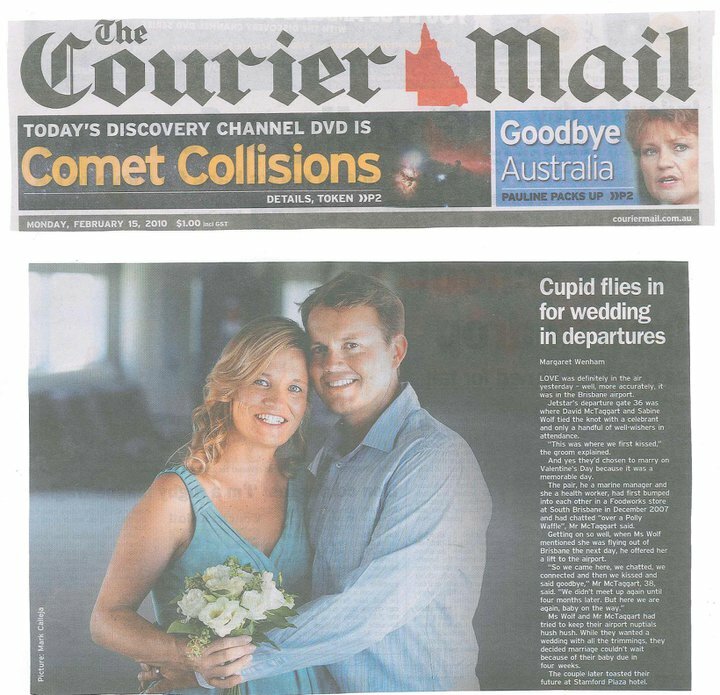 This quirky wedding was featured in the Courier Mail, where many of the couples surprised friends and family first heard the exciting news of their marriage taking place. Brisbane City Celebrants love fun and quirky weddings and we are only too happy to share in the excitement of couples special day, wherever they choose to wed. If you enjoyed hearing about this quirky wedding that took place at Brisbane airport and are looking for an open minded Celebrant for your Brisbane wedding, Jamie would love to hear from you. Contact Brisbane City Celebrants for more information and to confirm availability for your special day.